Take 16 CDF runners, one easyJet* flight, a stash of ‘British’ tea bags and the wonderful city of Madrid. What could go wrong? We arrived. We got to our beautiful apartments. Then, within an hour of arriving, Carl shouted “ENGLISH” at a Spanish waiter. We had a good start. We’d travelled to Madrid to run the Rock ’n’ Roll Marathon and Half Marathon. For a few of our runners this was their first full marathon. There were nerves and excitement waiting for the months of hard work to pay off. On our first full day we made our way to the race expo to collect our numbers (mainly thanks to Amber, our former Madrid resident who became travel guide and translator for the entire trip). The following day we ran with a local club, the Lactic Acid Junkies for a warm up before the race. A big thank you to their leader Rob who not only took us along some picturesque routes, he put up with our whines of, “is that another b*stard hill?!”. Not to mention the best part of running with the LA Junkies; they finish every run with Mimosas. We love Madrid! Now, as many readers will know, pre-race nutrition is key. We take this very seriously. Red wine, cheese, tapas and ‘volcano cocktails’ are all important elements in the diet of an athlete. And we followed this rule closely. It’s hard in a city like Madrid not to take advantage of the local food on offer…or walk 10 miles a day before running a marathon. The things we know we shouldn’t do but do anyway. So, race day. What an atmosphere. Thousands of runners in the middle of this magnificent city, bands playing along the way. It was a fantastic course with so much to take in but the hills were tough. It’s safe to say though that every single one of us loved the experience, no matter how difficult it was at times. On a side note, before the race we had an email stating, “Race supporters on roller blades are medical staff. Do not be alarmed if they spray coolant on your legs”. We thought this was a translation error. No, they’re a real thing. And they’re stupid and annoying. Not only do they stop immediately in your path after weaving in and out of several thousand runners, they also spray said coolant alarmingly close to the skin of their ‘victims’ (although very few other people seemed concerned by this lackadaisical approach and potential burn risk). Most importantly we all finished our races and after months of hard training, we couldn’t be more pleased. Congratulations to Mike, Mik, Amber, Leah, Richard and our friend Brian for completing the full marathon. Also to Carl, Steph, Rich, David, Shaun, Kem, Paul, Howard and Tom who completed the half marathon course. Not forgetting our CDF cheers squad of course, Ella, Matt, Josh and Jade. A special mention to Honard Honk (aka Howard) who, at the time of writing, has been running for 108 hours 12 minutes and 34 seconds at an average pace of 04:35 min/km**. Last spotted striding past the Bernabéu, we’ve been informed that Honard is in a state of delirium, aggressively listing Spanish craft ales at passers-by. If found, please do not approach. We spent the rest of our time taking in the sights, eating, drinking even more and generally being tourists. We had one last run with our new friend Rob on Tuesday and it was time to come home. So there we are, Madrid Rock ’n’ Roll Marathon and Half Marathon, done! It’s wasn’t just a race; it was a holiday with a group of great people. The one thing we have at CDF Runners is a fantastic social community. We train hard but we have just as much fun and we’re always there to support each other. Trips like this, yes are about achieving your goals but swigging prosecco from the bottle in a park while watching the sun go down is just as much a part of it. These aren’t just great clubmates, they’re friends. **Not really, he ran the half marathon but his chip time is still ticking over as we speak. It’s a mouthful of a name for one race, but this was undoubtedly the biggest race any of us had ever run. Just think, if we won we could be a WORLD CHAMPION. Probably not likely, but it was nice to think about it. Then again, the bloke who went on to win it fell over on the start line, so anything is possible. 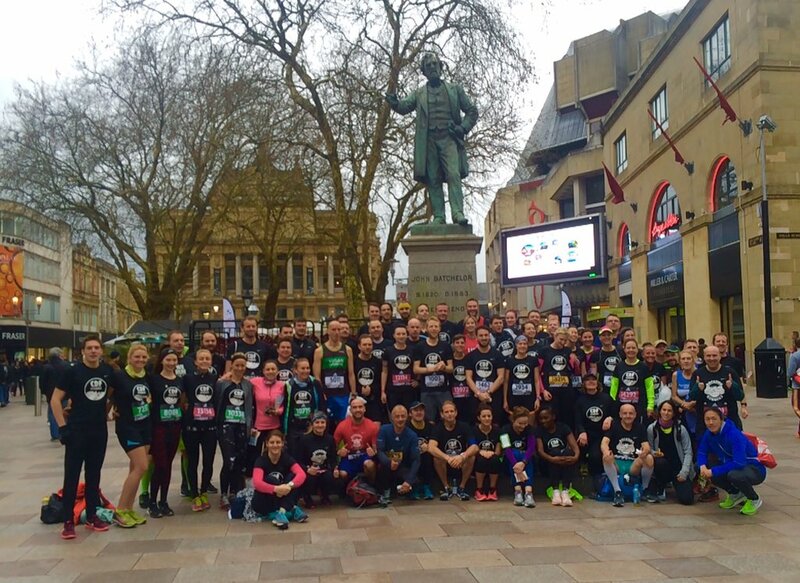 It was awesome to be joined by runners from our sister clubs in Liverpool and London for a monster team photo! It was also the first time we got to show off our fantastic new running tops with logo courtesy of our very own Bernie Martin. The weather forecast was always a bit iffy, but it’s not as if we haven’t run across the barrage in the pouring rain more than once. If anything, this gave us a massive home advantage! However, when the weather hit, it really did hit. By that time our runners were strung out from Roath Park to many poor souls on the barrage itself battling a massive downpour and 40+mph gusts. It was brief but plenty to soak us all through. Despite this, the weather was unable to stop our runners producing incredible PBs all over the shop. The majority of us ran our best ever half marathon, and nearly all by a big margin. The occasion and attention of the world focussed everyone’s race and pulled us together as a team to smash it. Whether running solo or in a pace group, everyone’s games lifted to give a brilliant performance spurred on by a soggy but enthusiastic crowd. The jelly babies strewn all over Roath is testament to the crowds generosity (and the clumsiness of tired runners). We also volunteered to marshall on the Easter Sunday Cardiff Junior parkrun which was awesome, especially with so many kids standing in the rain cheering us on the day before. We learnt the Cardiff’s record for their 2k course is an unbelievable 6:24 by a 14 year old! Feeling humbled, we went to Coffee #1 for recovery coffee and recovery toast.  The year’s first major is challenge has gone, and we now look forward to the Liverpool Rock n Roll weekend, which sees CDF Runners tackling various combinations of distances of 5k, half marathon, marathon and 1 mile. There’s still time to sign up and book yourself a hotel, so get yourself on it, it’s going to be MASSIVE.